Monday, July 9, 2018, 8:05 a.m. CDT —A total of 8 soccer team boys have been rescued. Four more boys were rescued by Thai Navy and international dive teams with oxygen tanks from the Tham Luang Cave in northern Thailand today. The rescued boys were brought out on stretchers. As night falls in Thailand, the rescue operation is done for today. Four soccer team boys and their coach remain in the cave. The 4 boys rescued today were taken by helicopter and ambulances to a hospital in Chiang Rai. 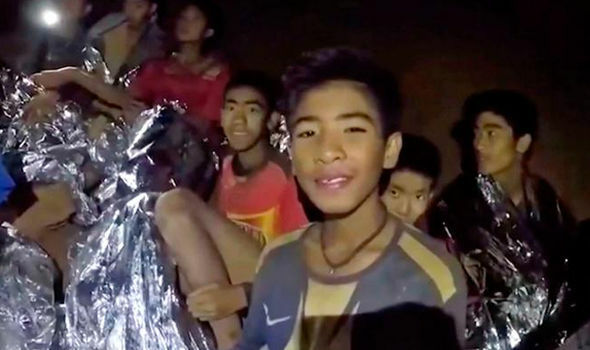 Parents have not been allowed to see the rescued boys, but they are reported to be healthy and hungry for fried rice, Thai officials told reporters. Sunday, July 8, 2018 , 10:15 p.m. — The dangerous rescue of the remaining boys on a soccer team and their coach in a north Thailand cave is underway. Divers rescued 4 boys earlier Sunday. The acting governor of Chiang Rai province confirmed 4 boys were rescued. The strongest boys were rescued first. 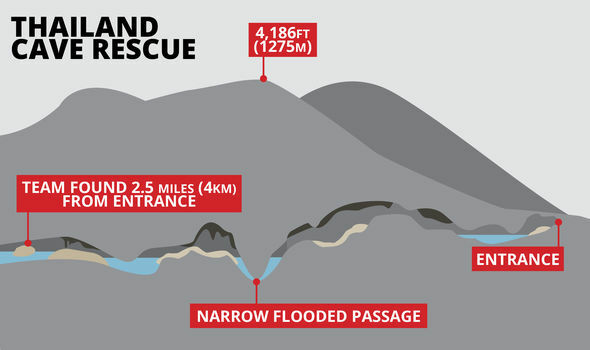 The boys trapped in the cave for 16 days, were escorted by divers through the 2.5 miles of darkness and murky waters of the partially flooded cave. The 4 boys were helicoptered and taken by ambulance to a hospital in Chiang Rai. Torrential rain outside and dropping oxygen levels inside the cave forced Thai officials to rescue now. People have been praying for the Thai soccer team and rescue operation. International divers, including divers from the United States, Great Britain, Australia, are there to help the boys and coach get to safety. 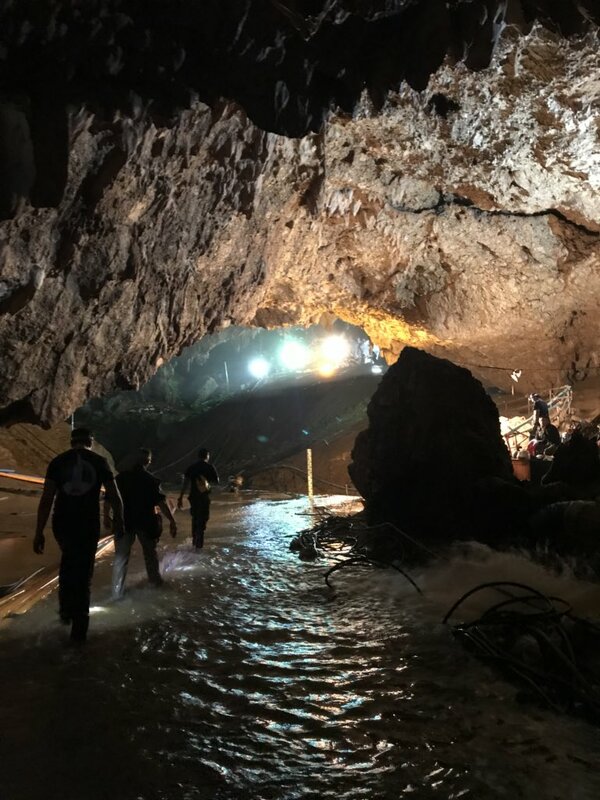 It’s a race against time, dropping levels of oxygen in the cave and monsoon rains in the weather forecast to rescue 12 boys and their soccer coach trapped deep inside a partially flooded cave in Chiang Rai in northern Thailand. Thai Navy Seal divers found them all alive on late Monday, July 2, 2018. The soccer team and coach had been missing since June 23. 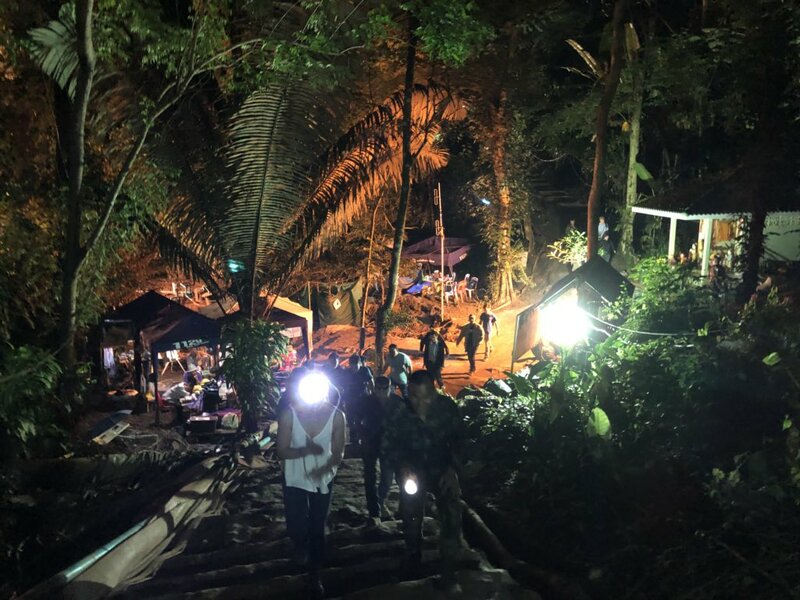 The search and rescue efforts in Mae Sae have attracted international attention and volunteer help. The Associated Press reported the boys are in stable condition. The soccer team is being treated by medics and receiving food and water inside the cave. The boys reportedly don’t know how to dive and swim. Their soccer coach has apologized for what happened. Rescue efforts include pumping out water from inside the cave and extending lines of oxygen into the cave. One Navy Seal died this week during the rescue operation. On CNN this week, a former U.S. Navy Seal in Colorado said making the young soccer team dive to safety could be deadly. Tesla and Space X’s Elon Musk is sending a team of engineers to help in the rescue effort. “Some good feedback from cave experts in Thailand. Iterating with them on an escape pod design that might be safe enough to try. Also building an inflatable tube with airlocks. Less likely to work, given tricky contours, but great if it does,” Musk tweeted today. After an explosion in August 2010, 33 miners were trapped in a mine in the desert in Chile for 69 days. The Chilean government contacted NASA for help. They were individually lifted up in a capsule, going up 2,300 feet to safety, according to the Washington Post and the Smithsonian Institute. This entry was posted in Asian Community, Houston News, National News, World News and tagged Thai Soccer Team in Cave, Thai Soccer Team Rescue Efforts. Bookmark the permalink.